It’s fashionable to rail against the LMS, to lament the shackles of institutional constraint and to advocate for abandoning the concept in exchange for a DIY nirvana. There’s definitely something to the no-LMS movement, because it emphasizes individual control and grassroots innovation. But, there is also a role for the LMS in higher education. If for no other reason than the simple reality that most instructors, and many students, aren’t ready, willing, or able to forge their own solutions. Nor should they be required to. The DIY hobby craftsperson ethos is inspiring, but institutions have an obligation to provide tools to enable their faculty, students and staff. 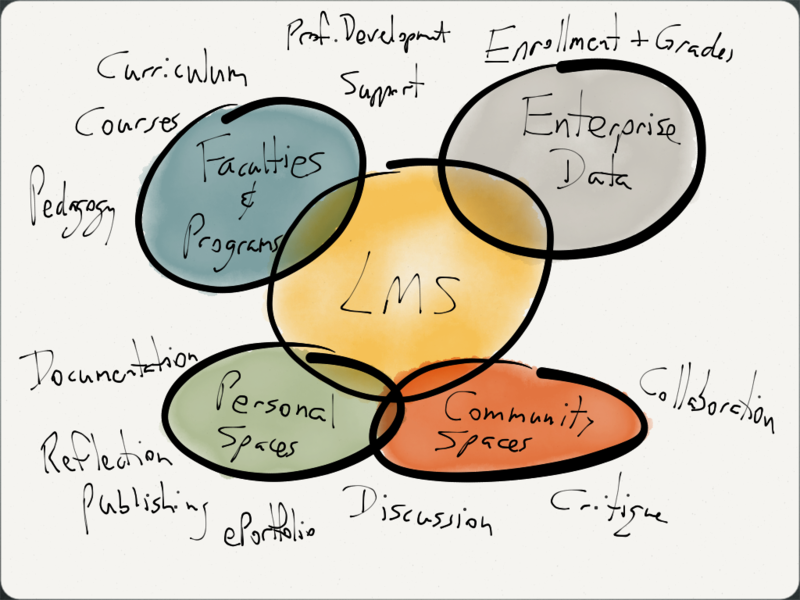 The LMS is only part of that – but I think it is a core part. From an institution’s perspective, the LMS is the glue that holds everything together. It provides access to courses. It ties grades to the registrar’s office. It provides a core set of tools and resources for offering courses online. It’s not the whole widget, but it’s an important part of it. Much of the fun and innovative work happens outside of the LMS – blogs, wikis, collaborative assignment managers, etc… But, even non-LMS platforms start to take on the characteristics of the conventional LMS – tracking students’ activity, providing access to resources, connecting assignments to grades, etc… Even a grassroots No-LMS environment eventually grows to resemble an LMS-like space. And, there is some interesting innovation going on within the “conventional” LMS – with some really compelling things showing up to support thoughtful course design, effective assignment aligned with the goals of instructors and students, and the potential to blur the traditional boundaries that restrict activities within the LMS. It’s not so much the tool that matters, but what you do with it. I’ve seen profs do really interesting things with our creaky installation of Blackboard 8. And, I’ve seen profs do downright traditional and boring things with our non-LMS campus blogging platform. It’s not the tool that defines creative teaching and learning. 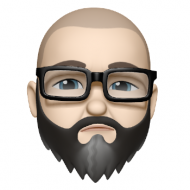 So, I look at the LMS not as shackles of institutional control, but as a means of providing a set of tools to individuals, to ensure that we’re doing a decent job of teaching online. I’m up to my eyeballs with campus LMS requirements documentation, so can’t comment much more than that at the moment. But, I believe the LMS is important as an equalizing platform. And, that people (faculty, students and staff) should be encouraged to explore and build both within and outside the LMS. structured anarchy? sounds like my life! 🙂 Thanks for the link – some great stuff there. In theory I agree, but I have to push back a bit on this because some tools define the space they are in. Could you ride a tricycle to work? Maybe, but probably not the best tool for that scenario. I’ve seen people do amazing things with MS Paint but I’ll likely never find it useful for what I’m trying to accomplish (but it doesn’t discount that the tool is useful). I couldn’t agree more that the LMS is a mainstay for schools and one that is not going away, nor does it need to. But I do think the current implementation from many companies dictates at least through UI decisions a convention or practice that is less engaging. I’m hoping you’ll be able to blog more about what you’re finding through the research you’re doing though. I’m very interested in the idea of student work outside of the LMS that then gets rolled back in for grading and possible discussion. Martha and I were talking about a feature Canvas had shown her at one point, though I don’t think they use it yet, where a student has a bookmarklet and can do their work anywhere and use the bookmarklet to submit their work. No logins or navigating the LMS to find where to submit. I think some of that is the future. I’m hoping maybe the DS106 group could have discussions with them to continue to build out ideas like that because I think it could be extremely beneficial. exactly. starting with a suite of tools, strategies, models, etc… is the only approach that makes sense. Except – if you don’t own the means of production, you are mostly beholden to those that do for any small freedoms they grant you. “but institutions have an obligation to provide tools to enable their faculty, students and staff” – well, we knew it wouldn’t be that long in IT before you drank the kool-aid, right? 😉 Just baiting you. I would have an easier time accepting this if the amount of difference in the LMS we were implementing in 1997 and today compared even vaguely to the amount of difference in the internet in 1997 to the internet today, or the forms of communication and interaction we’re seeing therein. They just don’t, not even by an order of magnitude. All LMS have done is lulled institutions into the sense that they have dealt with the disruption to their business which networks are causing and going to continue to cause. In so doing, they’ve helped keep us from innovating our business (and please don’t tell me its not a business- it may be_more_ than one, but it is definitely a business, of selling certification), while others not wed to the business model steadily innovate past us. My $0.02. Yep, it’s all about exploration, and mixing and matching, so to speak. … I’ve been giving a bit of thought to this issue of DIY and LMS. I agree that amazing things are done within a proprietary LMS but when I mention at presentations that they TEND to be constraining, I see a lot of nods from faces in the crowd, and you’ll find quotes from Lisa Lane and George Siemens in the article above corroborating that impression. I also agree that what I call DIYLMS can be vacuous in the wrong hands, but for me personally, I prefer the freedom I get with mashing up my own LMS. Mainly I was intrigued to find the take on the issue here and I’m happy to join in the conversation. In the end I think it’s a matter of making the best use of the tool you’re most comfortable with, and whatever works, go for it! Thank D’arcy for putting down in electrons what I have been thinking for a while now. For my college’s situation, I really feel we need to provide our students, where many are first generation college students, non-traditional age and up against many odds for success, with tools and environments that work, that are consistent (somewhat) between courses and that reduce the techno-hurdles a bit in order to build confidence with their own skills and increase their willingness to then stretch and experiment with other tools. As much as I would love to have a free wheelin’ ds106 going with all of the students at my school, I know it would not work out as well as I would hope. Not without some handholding and some baby steps up up front. That doesn’t mean I won’t keep helping faculty and students find tools that work for them and provide as many options as we can support or encourage to best fit the instructional and learning needs for our students and faculty. So, I am starting to emerge with less of a “small pieces loosely joined” vision and moving to one of a “large piece (LMS) appropriately joined with small pieces that do things better/efficiently”. We have to be pragmatic both with what we can support as an institution, what we can ask students to do and how we can push all of ourselves to want to continue to learn and use new tools in interesting and engaging ways without scaring off folks. Techno-fear defeats the entire purpose. This subject has occupied my thinking for a long time now, of course. I lament, I rail, I don’t believe in nirvana. Sometimes, I cave. Or, like Audrey, massage my position. The LMS is the glue because there is no better glue if we need glue instead of tape. As faculty, if we have many students, we need the M. Some M. From somewhere. The LMS is closed, and that’s bad, and we could change that. We argue about the extent to which students should be required to learn the tools and techniques that would make them effective online, as well as the course content. We can keep arguing. But what’s crucial is what you say about the profs you’ve seen do amazing things in an LMS, while others are .doc dumping. If a prof is comfortable on the web, has seen and experienced what’s possible, they can whip any LMS into shape to do something valuable. If they don’t have that experience, they can’t. To me the key is whether they start their thinking in an LMS or on the open web, which is why I try to teach faculty (and anyone else who will listen) to start with their pedagogy first, then look at tools. But reading what you’ve written here makes it clear I should tell them they also need to start on the open web, because we are not all Jane Austen. We can’t stay in our tiny village and create wonderful stories. Most of us need to get out there and experience the world before we can come home and create something good. The spirit of DIY shouldn’t be jettisoned. It should be used to inspire people to tame their LMS into what they want it to do, or take their core elsewhere if they want to. Great article on role of LMS in higher education. I agree with the Audrey and Lisa comment on state of LMS being closed. But there are a few social learning platform trying like us, Myklassroom.com trying to connect students and faculty across campuses, we try to connect them based on the interest subject area etc. Having a single large LMS to cater the growing needs would probably lead to a complex product. We believe in an app-based approach similar to that of social networks. Having different vendors developing quality-learning apps such as games, simulation or even different testing methods will help the tie the loose ends. 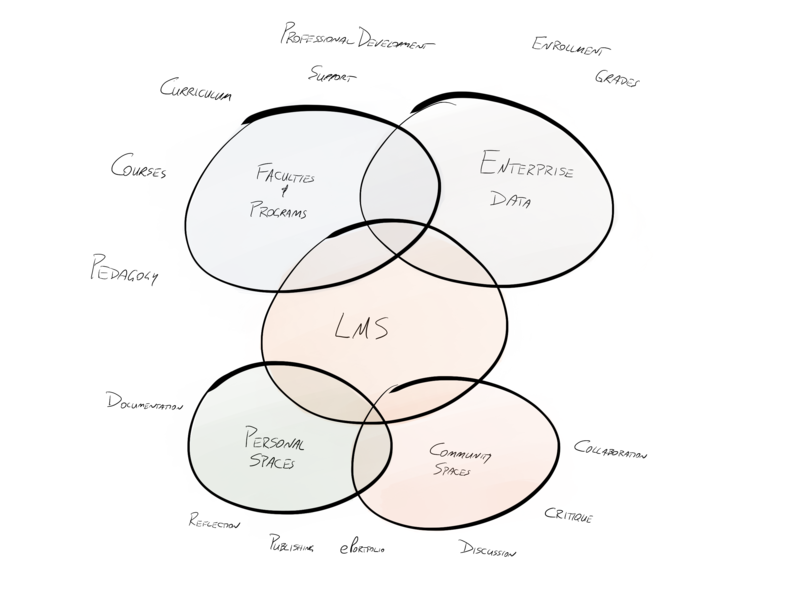 LMS should act as glue between the institutions and provide better analytics on the learner engagement and tools to improve them. We are startup focused on building the next generation on social learning platform with rich socializing features and apps to engage the future generation. Feel free to register as a school and try out our beta version for free.